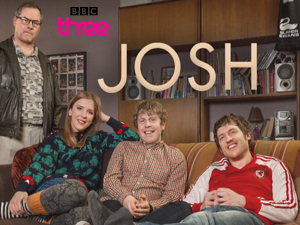 Josh is the brand new sitcom for BBC Three, written by Josh Widdicombe and Tom Craine. The 6×30 series made by BBC Comedy and directed by David Schneider, will air on BBC Three on Wednesday 11th November. After a hugely successful pilot for the BBC’s Comedy Feed pilot initiative last year, this much-anticipated debut series sees the return of Josh, his flatmates Kate (Beattie Edmondson) and Owen (Elis James), and their relentlessly annoying landlord Geoff (Jack Dee). Frustrated, single and reliably grumpy, Josh feels completely stuck in his life with Kate and Owen, and as the series progresses, things only go from bad to worse. From a disastrous pool party, via public humiliation at his own birthday, to being toyed with by his high school crush, this baby-faced Victor Meldrew routinely fails to be left alone to find the quiet life he craves. Meanwhile, Josh’s flatmate – and childhood best friend – Kate finds life equally difficult. An enforced holiday to Clacton-on-Sea reveals a rather unpleasant competitive streak, and a disastrous date leads Kate to discover a hugely embarrassing reputation she gained at university. Owen, however, continues to drift along happy as Larry. He is a bundle of charm, with a never-ending fountain of anecdotes about nights spent with minor celebrities, from meeting Tasmin Archer in fancy dress to watching Shaggy wee in a pool. But as different as they are, they all feel equally tormented by their strange, fusty landlord Geoff, as he inflicts himself upon their lives at every turn. Geoff is a man of many ideas and all of them are bad. Complementing this excellent cast are some tremendous star cameos, including Jennifer Saunders (Absolutely Fabulous, French And Saunders, The Comic Strip Presents) who makes an appearance as Kate’s mother and becomes the object of Geoff’s affections. Jack Dee and Jennifer Saunders in an (unrequited) love story – it is the TV event Britain has been crying out for! Elsewhere, Romesh Ranganathan (Live at the Apollo, Mock the Week), James Acaster (Mock the Week, 8 Out of 10 Cats) and Paul and Barry Chuckle (your childhood) all make an appearance.